As the leader of his own squad of Decepticons, Kickback is more independent than most of those under the command of Megatron. He uses his freedom to surround himself with friends, who he then blackmails into becoming his servants. Kickback has been around the block a few times. Mostly he’s a grasshopper of some sort, but the name has also made its way to various other types of Transformers. In Generation 1 he was a grasshopper who got his head smashed in the 1986 movie by Kup to later be reformatted into a Sweep under Scourge’s control, and then he mysteriously shows back up in Season 3 as his old hoppy self. He also happens to be the lamest of the G1 Insecticons; Bombshell controls minds, Shrapnel controls electricity, and Kickback can jump far and kick things. Fantastic. Anyways, enter Beastformers, and Kickback is a Laser Beast grasshopper. He became a Mini-Con in Armada (video game appearance), then he somehow manages to become a tank and part of Bruticus Maximus in Energon. Apparently someone liked the big heavy vehicle theme, and he became a bulldozer in ROTF novels and finally back again to being a grasshopper on Cybertron. Who knew Cybertron even had grass? My fascination with Kickback began way back in the ‘80s as a wee little kid. He was one of the few Transformers I owned (compared to my excessively large GI Joe collection). Years back when I wasn’t collecting, I had my parents sell him off in a garage sale (not knowing better to sell him via eBay) and managed to get back a newer toy via the Universe reissue Insecticons which I sold last year. So when Kickback was announced for the Fall of Cybertron toys, I was excited to have him back again. We’ll see how long I keep him this time! A nice departure from the standard car, truck, tank, or plane alternate mode, Kickback turns into a Cybertronian insect. This is a storyline way of saying he turns into a grasshopper since Cybertron doesn’t have grasshoppers… but apparently they have generic ‘insects’. Anyways, I like to have Kickback on my shelf just for sheer variety. Overall I like the alternate mode, but not as much as the robot mode. What gets me about the insect mode is the lack of sturdy locking parts. The front four arms just swivel around and sit, the legs are kind of clunky, and the abdomen (formerly the arms) don’t lock tightly into place. All of this makes for a sloppy alt mode which isn’t as easy to fiddle with as something like a tightly tabbed together truck. And that’s pretty much where my concerns end. Kickback accomplishes exactly what an updated toy needs to do. The design is a fantastic update from Generation 1 with a robotic insect feel, huge legs, awesome color scheme (who doesn’t like the black/purple/yellow Insecticon colors???) and the ability to store his weapons (as large as they may be) in insect mode. Molded detail is done very well, with sweeping lines all over, sharp points, and a great insect head design complete with antennae. He’s got wings on his back consisting of two arms/claws which are further filled in by connecting the swords he comes with. Color detail is great too; the paint apps themselves are impressive with purple, silver, gold, and a little pink thrown in. The majority of the colors come from molded plastic, and there’s great diversity everywhere. All over there is charcoal grey, silver/grey, and purple. The mold is designed as such to break up the color scheme without feeling like a mish-mash of plastics. 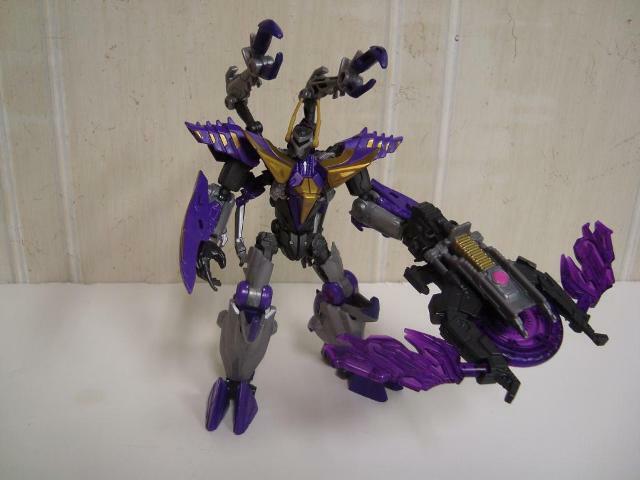 As mentioned above, the weapons all store on Kickback’s insect body. The translucent Energon swords clip in to become part of the wings, and the Gear Shredder can clip in between the wings. And that’s the cool thing… he comes with a Gear Shredder! Not many figures, especially in the deluxe size class, come with a disc launcher. It doesn’t shoot far at all, but at least it’s different from the typical pistol/rifle/missile launcher you get everywhere else. The downside is the sheer size of the Gear Shredder. It’s massive. This doesn’t matter too much in insect mode, since you can just have it lie around, or if you clip it to his wings it doesn’t affect balance due to the low center of gravity. Wielding it in robot mode is a different story all together. The weapon connectivity is all pretty awesome, though I wish Hasbro would have shown somewhere in the directions how to hook all this together. Initially I was disappointed that the Gear Shredder would just sit around if I wanted him displayed as a grasshopper, but photos on the internet show how to attach everything. I would have thought a company selling a toy would want to advertise everything it can do without the customer having to do a Google search to figure it out. I guess I was wrong. I really thought Kickback was kind of flat in the 'fun' department, but when I found out all of what you can do with the weapons via the internet, his enjoyment factor increased dramatically. The transformation going from insect to robot and vice versa isn’t terribly difficult, nor is it anything to write home about. More or less it’s a bunch of swivel arms here, shift legs there, and you have the mode you want. He does have a nifty way of shifting the head/chest area around, though it can be cumbersome getting it shifted properly due to the partial wings on his chest getting in the way. I like is how things are well proportioned from one mode to the next. Instead of just flipping a couple things and having the same basic shape become robot or insect, you get a totally different proportion in either mode. In insect mode Kickback has a pretty beefy mid-section with a low center of gravity, and in robot mode things are well stretched with a thin torso and thick lower legs. The proportions give him a good center of balance, and even though he has wings and some hefty shoulders and arms, the lower legs do a great job of evening things out. He’s actually quite bottom-heavy once you get it all together. Aesthetically Kickback fits into a few different toylines. He can obviously blend in with your WFC/FOC collection, and he arguably makes for a good Classics rendition for the character. I believe he would also blend in well as a Prime figure, though I don’t personally own any of that line. Just looking at the sweeping design lines and sharp points on the shoulders, forearms, and legs, he seems like a good fit amongst characters in that design. Even though he has an aesthetic that may blend in well to the Prime line, he’s on my shelf as a Classics figure. The lines and points don’t mesh quite as well as the boxy look of most Classics figures, but the aesthetic allows for a more insect-feel and differentiates him from the other characters. 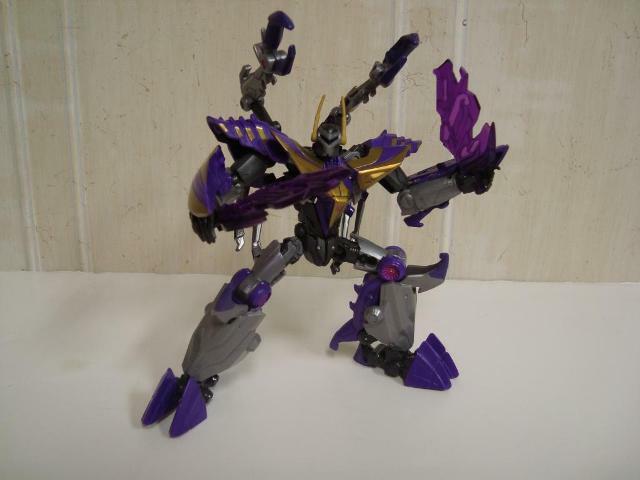 Not surprisingly, the color palette is exactly the same in robot mode as it is in insect mode, but due to the way things are repositioned, you get a better degree of the purple and gold markings along his shoulders and arms. The variance in grey plastics works well here, as the silver/grey and the charcoal grey are spread out throughout the mold and it gives some variety throughout without looking like a splash of clashing plastics. Kickback has a cool visor head mold with light piping – which doesn’t actually work that well. I haven’t busted out my halogen spot lamp on it yet, but traditional lighting doesn’t seem to shine anything through. It’s a sad thing, really, since I always like it when the light piping works well on toys, especially ones with visors instead of separate eyes. Overall I like the design of the toy and I think he was well thought out. Check the photos attached here, he may be what you are looking for, or you may not like him at all. Kickback has some of the biggest feet I have ever seen on a Transformer (and you know what they say, big feet, big… nevermind, he’s a robot insect and that doesn’t apply here). Basically that boils down to him having a great balance and you can get him into some great positions. That’s a good thing since the aforementioned gigantic Gear Shredder can make him lean one way or another. Also, I have noticed a significant shift in weight if you put the sword blades in a crossbow pattern on the Shredder, or if you shift them towards the handle. Kickback holds the weapon much easier with the blades closer to his hand. As a new toy the weight isn’t too much of an issue, but as that elbow ball joint wears over time it will be harder for the arm to support the weight. Luckily, you can also take the Gear Shredder and clip it to his wings so he can dual wield the two swords. 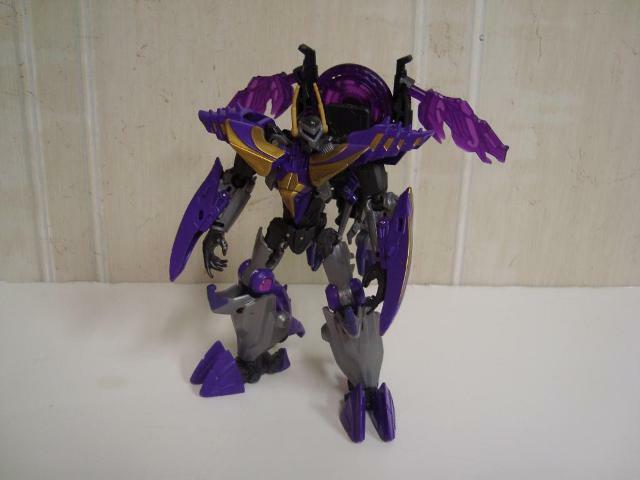 Or you can just as easily stick the swords in the Gear Shredder on his back and give him a winged-backpack look. In my opinion Kickback has a cool design aesthetic, and all the options for his weapons just add to the fun. Transformation Design: 7. It isn't complex, but it isn't incredibly easy either. However, moving parts here and there is easy, and I think it brings some fun to a transformation that could have been rather bland. Durability: 8. The plastic is tough, but there are a lot of ball joints that will wear over time. I don’t see anything breaking on him unless you abuse him. The insect arms could be the weakest point. Fun: 9. Good balance and some unique weapons you can do a lot with. That all adds up to some good times. Aesthetics: 9. He basically fits into 3 toylines. That’s difficult to pull off for any toy, and Kickback does it well. 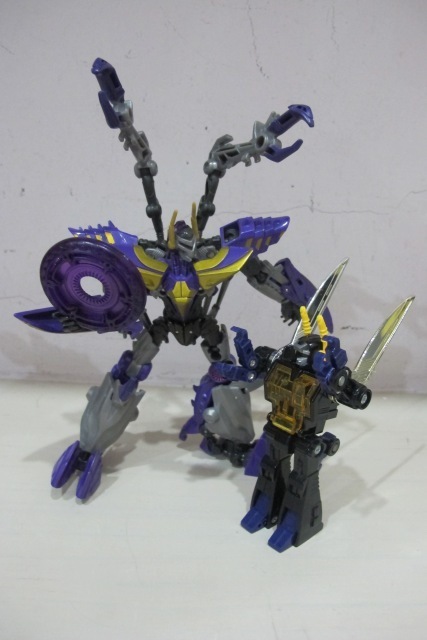 And Insecticon purple and gold is sweet. Articulation: 7. He’s got quite a few joints, but things like his shoulderpads hinder movement, and his wrists don’t really go anywhere. He has enough joints to get the job done. Value/Price: 8. The Deluxe size class isn’t cheap anymore. But there’s a lot of things to do with him for the cost. Overall: 9. I really enjoy Kickback. He brings some variety to the Decepticon ranks, can fit into 3 different toylines, has 3 unique weapons that you can combine, store, or both, and he’s well balanced. I wouldn’t say he is a must have, but I have been thoroughly impressed with him. He’s definitely worth consideration if you have the cash and see him in the store.